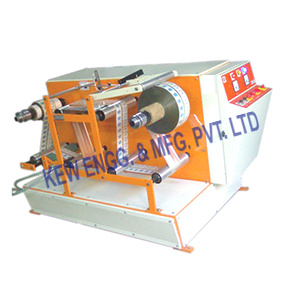 Winder Rewinder for Inkjet Printer Thermal Printer manufacturer, in any paper, film, and foil converting industries, the Winder / Rewinder (Doctor Machine) is used widely for online printing of Mfg. Dt., Exp. Dt. B. No. etc. using an Inkjet printer or other contact coding machines from Roll to Roll at high speeds & then these printed rolls are used in various packaging machines. Mechanical 1.5 / 2.5 Kg. Optional Magnetic powder brake with tension controller & Torque control potentiometer. Provision for incorporating Ink Jet Printing System with Hot air ink drying. Also, we are a manufacturer of Air Shaft Textile Machinery Spare Parts. M.S. CHANNEL FRAME BODY with mechanical clutch & break unwind/unwind system, unwind/rewind shaft & cones for printed material holding cores for printed material cores, alum – guide roller & all other standard accessories.